Looking to UP! your Food Skills? 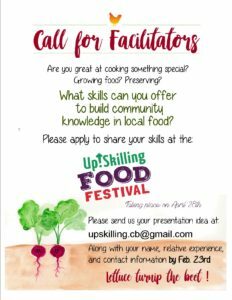 From growing, sourcing, harvesting, storing, preserving and cooking local and healthy food – there is a workshop for you! Open to the entire island community, there will be a total of 16, hands-on, 1-hour workshops hosted by a local community expert. We will offer a complimentary, locally sourced and healthy lunch, fair trade tea and coffee, a common area for networking and musical entertainment, and lots of food related info! New Dawn Centre for Social Innovation, 37 Nepean Street, Sydney, NS. Participants will develop the skills and confidence necessary to grow edible sprouts at home using resources at hand. This workshop is a mix of discussion, instruction and hands-on practice. Topics include: sprouting basics; difference between sprouts, shoots and microgreens; and sourcing equipment and supplies. Folks will leave with simple equipment and seeds to start sprouting at home. This will be a lecture & discussion style work shop. The focus will be on wild plants and how to use them for flavour to delight the senses, and to become more curious about the world around our feet. The presentation will provide facts and anecdotes about a few main tasty wild plants and where to find them. Participants will enjoy samples of foods and tea wildcrafted from local wild plants that can be found right in your back yard, learn how to safely identify them and use them in the kitchen. This hands-on workshop will give participants the opportunity to build a chicken egg incubator from scratch. Together, participants will build the incubator and the learn the basics skills required to hatch chicken eggs including correct temperatures, humidity egg turning etc. Join Estelle from Thyme for Ewe Farm as she walks through the steps to successfully grow culinary herbs such as basil, thyme, rosemary, lavender, cilantro and more. Participants will learn the difference between annuals and perennials; heat and sun requirements, watering and harvest and special requirements. Take in this unique international experience as Chef Seung Hyeon from Flavor Downtown brings you from the kitchen to dining room. Participants will learn how to prepare Korean Barbequed Pork and the social aspects that go along with the Korean dining experience. Local Farmer Len Vassallo from Blue Heron Farm will walk participants through the steps to successful transplanting. Participants will learn why it is important to transplant certain crops, learn about the different types of equipment that can be used for transplanting like block makers, paper pots and seeder, and get hand on experience seeding blocks which they can bring home. Participants will learn from start to finish how to make a wet vegetable ferment along with the steps required to produce a cabbage rejuvelac. There will samples of a variety of ferments to taste, recipe handouts and one lucky participant will go home with a jar of the finest Alchemy Acres Pickles. A hands-on look at delicious and nutritious salad combinations and crowd pleasing homemade dressings. Registered Dietician Lorraine Teasdale will teach participants how to make the most of your seasonal garden bounty. Lots of creating, sampling and recipe sharing in this workshop! Join Demarest Haney to get first hand experience at the skills and supplies needed to make soft cheese and yogurt. This workshop will include a discussion about cheese and yogurt making, participants will ferment dairy into cheese and yogurt, flavor it together as a class and get to sample the final product. Yum! In this lecture and PowerPoint style workshop participants will learn all about the benefits chickens can provide in the garden. Nicole will share her knowledge gardening with chickens including such topics as manure and deep litter, tilling, all-natural pest control, happiness factor, how to manage chickens with a chicken tractor, simple fencing, “chunnels” and more. Mix, kneed and bake your way through this workshop as Shane O’Handley from Meals on Wheels introduces you to why sourdough bread is not only tasty but more easily digestible than breads made with non fermented grains. Participants will get to sample freshly made sourdough bread take home a sourdough starter to use at home. Chef Corey from The Mermaid is no stranger to cooking for a crowd and he wants to share his expertise with you! From “The Get Together” (8-10 people) to “The Big Party” (20-100 people) participants will learn about strategies, style, tools, stress management and more informative workshop. For the Fermenter that is ready to go beyond the basics Brenna Phillips from Punch and Jingle Ferments will demonstrate how to make a batch of kombucha from start to finish. Participants will get help troubleshooting their own fermenting experiences at home, learn about equipment, ingredients, sourcing and sample unique ferments like Pinapple Tepache, Sweet Potato Fly and Maple Water Kefir. There will be, handouts, recipes, books to have a look at and a draw for a SCOBY at the end of the workshop. Jaymie from Hopeful Homestead brings jams to the next level with her unique fruit preserves. Participants will learn about basic canning safety, different types of traditional and not traditional recipes, useful tools, how to reduce waste, pressure canning as well as do some troubleshooting. There will be sample and handouts provided and a draw at the end of the workshop for a 3 pack gift box! Join Amber Tapley from Amber Dawn Wellness to learn how to create tea blends to sooth your soul right at home. Amber will walk you through common herbs for tea, their medicinal actions and how to blend them. Participants will enjoy a hot cup of tea during the discussion and there will be tea blends available to take home. Explore the art of Indian spice blending with Sireesha Reddy as she shows participants how to prepare Chicken Biryani the traditional way. Participants will learn about the ingredients and techniques, and sample this world famous cuisine as well as take home the recipe. The Up!Skilling Food Festival is brought to you in collaboration by: Island Food Network, ACAP Cape Breton, Cape Breton Food Hub, Ecology Action Center, New Dawn, Northside the Lakes Community Health Board, Central Cape Breton County Community Health Board, East Cape Breton County Community Health Board, SSHRC and Cape Breton University. Fun & educational activities will be organized for children (ages 5-12). The fee for childcare can be added to your admission fee. Click here for information on our 2017 Up!Skilling event.